The MICOOL App Rubric is a set of thematised points of investigation for a content-based education app. 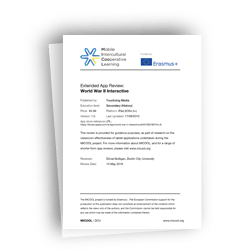 The rubric provides a highly structured set of evaluative statements and responses, which can be used to devise a systematised score for reporting on the suitability of the app for deployment in the classroom. The rubric was developed by MICOOL researchers at DCU in response to the lack of a publicly available and sufficiently detailed assessment tool for the evaluation of content-based tablet apps for use in European classrooms. The project defines content-based apps as those which contain instructional content, and often assessment, and may be used by teachers and learners directly to provide relevant information and testing on a topic (e.g. mathematics learning, language practice) – in contrast to creative apps, which may be used by teachers or learners to produce their own content (e.g. story-telling, movie-making, book creation). This important distinction defines the evaluation criteria of this tool. Using this rubric, content-based apps are evaluated using thematic question sets that emphasise the following investigative criteria: Quality of instructional content, Interaction Design (including Usability & Accessibility), Assessment & Feedback Design, and Technical and Support considerations. Additionally, the design of the tool emphasises the collection of useful descriptive information on the app being evaluated, including details of its publication, pricing, stated age-group and education level, platform limitations, and suitability to classroom or collaborative learning environments. You can download the MICOOL App Rubric as a PDF below. The rubric may be copied, deployed and used under Creative Commons Attribution-NonCommercial (CC BY-NC 4.0) licence. This document outlines the rubric in full, providing all points of data collection in detail, for use by researchers. The documents below are a sample of those generated during the development of the MICOOL App Rubric, and show how it may be used as a guide for a coherent and complete examination of an app being evaluated. These reviews were produced during the beta-development of the rubric, and helped to focus researchers on specific areas of ambiguity or requirements for change in the rubric, pre-publication.